Electrical System Services | Metro Transmission Inc.
At Metro Transmission Inc. our certified technicians are experienced with all of the components that make up your vehicle’s electrical system. From the battery to the wires connecting it all together, we’ve got your electrical system services covered! The first thing to understand about the electrical system services offered by Metro Transmission Inc., are the individual components that can be found in your vehicle. Alternator: The alternator is the component that powers the vehicle after the battery starts your engine. After the vehicle is running, the alternator is used to recharge the battery, as well as power all electrical elements of your vehicle (lights, radio, etc.). Battery: The car battery provides enough electricity to start your engine, and should be inspected every few thousand miles. It is typical to replace the batter in your vehicle every 3-4 years. Starter: The starter in your vehicle is used to convert the electricity into a mechanical form which allows your engine to start once the ignition is turned. Typically, you should test your starter once a year to ensure it is drawing the correct amount of current. Wiring: The wiring of your electrical system is what is used to connect all of the components above together. Our certified technicians will be able to test each component of your electrical system, and pinpoint the source of the problem. After this has been determined, we will discuss what electrical system services are needed and the best solution to resolve the problem. Understanding the different components of the electrical system is important when trying to understand how and why things go wrong. At Metro Transmission Inc., it is our goal to provide our clients with the education to help prevent costly future repairs. 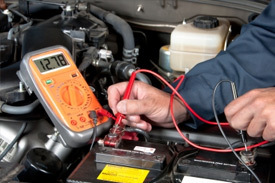 Below is a few tips to help you extend the life of your vehicle’s electrical system. Clean your battery and cable connections once per month.